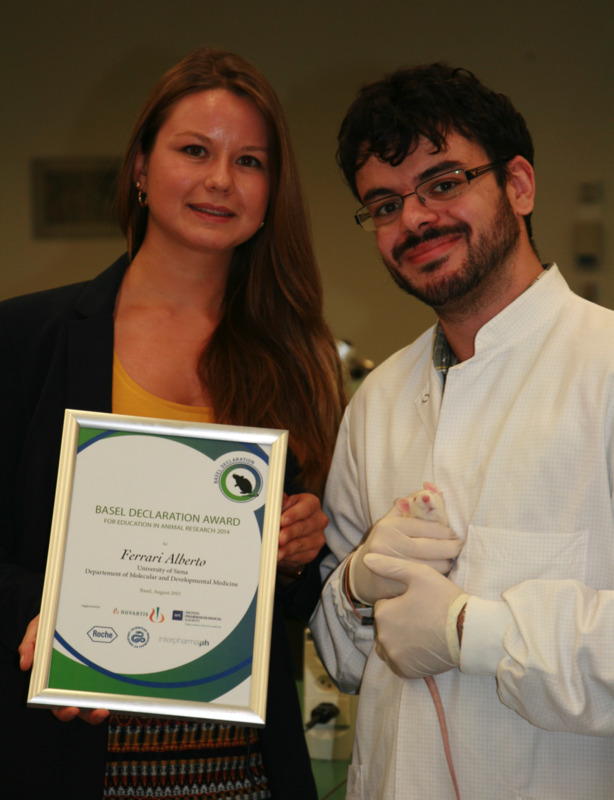 The Basel Declaration Society (BDS) has presented its fourth consecutive Award for Education in Animal Research. This year's prize-winner is Alberto Ferrari from the Department of Molecular and Developmental Medicine at the University of Siena, and board member of Pro Test Italia. The young researcher set himself the goal of firmly establishing the 3R principles in Italy for training researchers. The BDS is delighted to honour Alberto Ferrari (27), a committed young scientist with a talent for communication. At the expense of the BDS, Mr Ferrari is currently taking part in a one-week FELASA-certified course at the Institute of Laboratory Animal Science at the University of Zurich. The course focuses on how the 3R principles are implemented in day-to-day animal testing for the welfare of the laboratory animals. The 3Rs stand for "Replace, Reduce, Refine". "Replace" means that experiments on animals should be replaced, where possible, by alternative methods such as computer simulations or cell cultures. "Reduce": researchers reduce the number of animals per test to the absolute minimum through optimum test planning. "Refine" requires laboratory animals to be treated as gently as possible and looked after to the best possible standard - both during rearing as well as throughout the entire duration of the experiment.